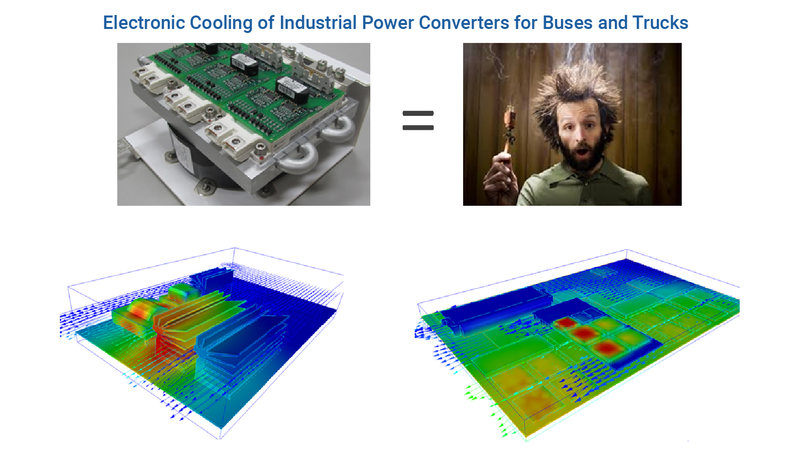 Electronics cooling can be as simple as setting up a fan curve and blowing air across a set of chips or as complex as the simulation of the copper traces within the PCB with localized heat pipes to draw heat away from high-power chips. Over the years, Predictive has analyzed a fascinating array of electronics system using CFD and hand-calculations (least we not get too confident in numerical methods). We look at our experience as the ability to give our clients not only the right solution but novel and cost-effective solutions to their electronics cooling challenges whether from packaging requirements, vibration and shock specifications that may limit the use of large heat sinks or just the need to have a quiet thermal solution without a noisy fan. Our experience is based on working directly with our clients’ engineering teams; our CFD consultants are not only experienced in thermal-fluids but in general mechanical design for stress and vibration. We have done the simulations and validated our models working hand-in-hand with our clients. This collaboration allows us to suggest cost saving solutions upfront in the process and to ensure that they will work based on our hands on experience in the field. That is to say, we are not just CFD simulation engineers but also generalists with field experience in verifying and validating our simulations against reality. This is our competitive edge – knowing the difference between CFD cartoons and CFD reality. 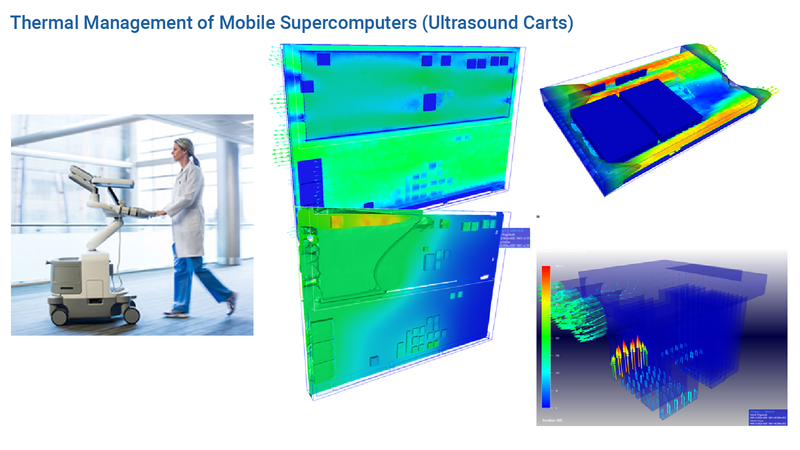 The field of CFD electronics cooling is huge and this section just represents a few highlights of work that we have done. If you have any questions, please contact us and we would be happy to share our experience or provide a quotation. One radial segment of a large automatic chip testing unit was thermally analyzed. The CFD simulation focused on the development of a new high-powered chip layout that included several daughter-boards. Force convection did the heavy lifting but heat pipes were also leveraged to extract heat from critical regions. Chip mounted heat sinks were also employed. 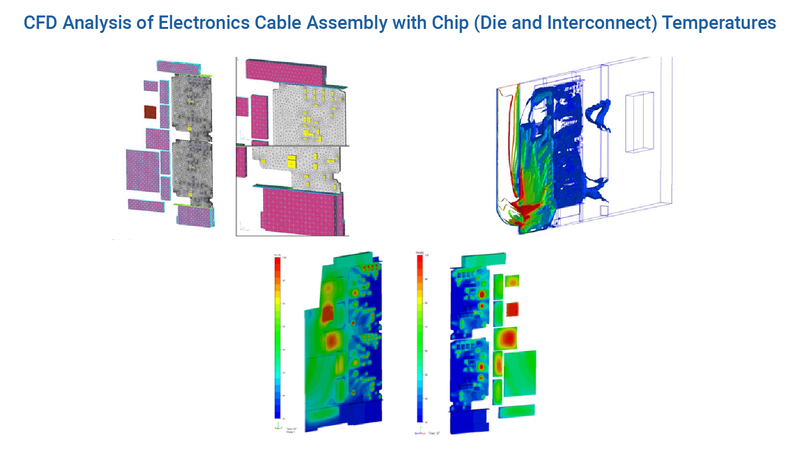 Thermal validation showed that the CFD simulation was accurate to within +/- 10% at chip interconnect regions and 5% over the PCB. Given challenging outdoor environmental conditions, our client needed the system to be thermal stable while encased in silicone gel and mounted on the side of a building or under solar panels. The thermal analysis looked at natural convection during diurnal heating and also the radiative cooling ability of the aluminum housing within onto black body surfaces. The thermal work started by calibrating the printed circuit board to experimental measurements. This correlated model was then encased in silicone pottant material and subjected to a variety of thermal conditions. Final predictions allowed the client to proceed to testing and to improve upon their mechanical design of the housing. This was a huge project for many years at Predictive Engineering. 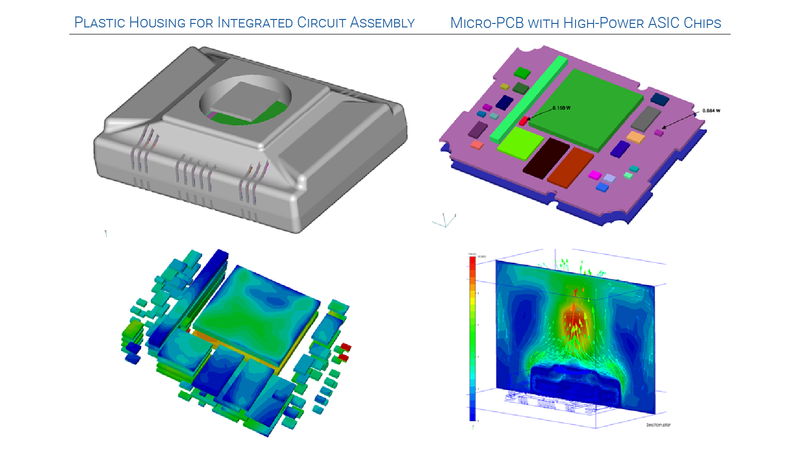 We ran thermal simulations on individual chip assemblies from die to interconnect to PCB and then out to complete PCBs and the complete ultrasound cart. 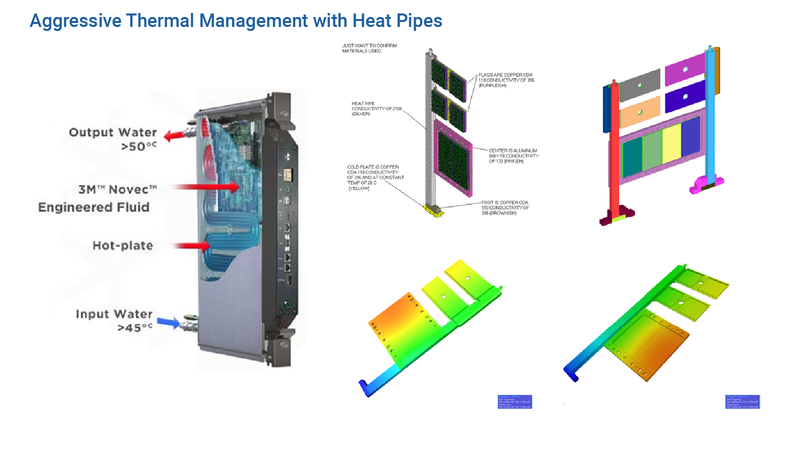 The thermal simulation work was validated by chip level temperature measurements and energy balance work on the cart that included the complete thermal envelope. One difficult requirement was to reduce fan noise to below 22 dB or whisper quiet. This required a series of baffles that would trap the noise while creating minimal back pressure. After hundreds of simulations, we transferred our knowledge base to the client and they are now performing the work in house. When the bus catches on fire from a burning power converter, one knows that the thermal design needs some work. 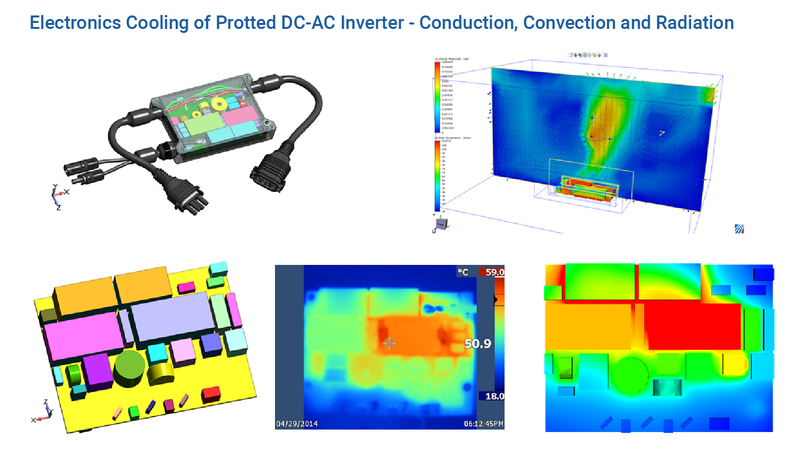 Predictive was engaged to provide a quick thermal analysis of a series of large power convertors. 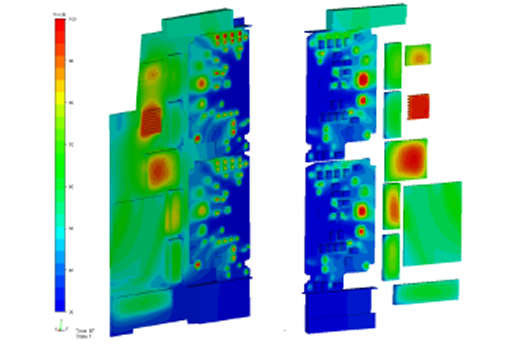 Our CFD consulting service showed that the design flaw was in the choice of pottant for the transformer and not in the general electronics cooling design. In other work for the client we optimized their use of heat sinks and the placement of high-power chips on several PCB layouts. One of our more interesting projects was the client’s requirement to have silent cooling of their compact, high-energy system. In collaboration with their engineering team, we developed a water cooling system that utilized a combination of heat sinks and copper chill plates. Although this electronics cooling system wasn’t the most economical to manufacture it provided stellar cooling that allowed the electrical engineers to crank-up the power due to low chip die to interconnect temperatures. The outer housing is plastic with strategically located slots to induce convective cooling on the internal printed circuit boards. This simulation looks at the structure’s ability to shed head via forced convection by an internal fan (not shown). A fan flow rate of 5 CFM was given as an initial starting point. The challenge on this project was the high-powered chips located in isolated regions of the PCB. After several optimization cycles, the final design achieved the temperature targets. Electronics cooling often involves using everything in the thermal toolbox. In this design, thick copper vias were used within the PCB to conduct heat away from high-power digital-optical application specific integrated chip (ASIC). The device is not land based so along with conduction, radiation was coupled to the thermal solution. A series of transient thermal analyses were performed to evaluate the design and the final optimized configuration was correlated to experimental work. This effort laid down the baseline for a whole new generation of intelligent cabling devices.